“Oh no! Not another recipe with mushrooms!” Ha! Ha! Well, can’t help it when I have a lot of mushrooms at home. Chinese dried mushrooms to be precise. But anyway, the mushrooms here are the supporting act. The main actor is the Kai Lan stems. According to the Wikipedia, Kai-lan, also known as Chinese broccoli or Chinese kale, is a slightly bitter leaf vegetable featuring thick, flat, glossy blue-green leaves with thick stems and a small number of tiny, almost vestigial flower heads similar to those of broccoli. As a group of Brassica oleracea kai-lan is of the same species of plant as broccoli and kale. Its flavor is very similar to that of broccoli, though not identical, being a bit sweeter. In this recipe, I use the kai-lan stems. These are usually imported and sold in supermarkets. Unfortunately, I forgot to take a picture of it prior to cooking. What you get is a stem roughly 15 to 20cm long and with very little or no leaf. It tastes much sweeter than the leaves in “normal” the normal kai-lan vegetable. I am told that this variety of kai-lan is grown specifically for its crunchy and sweet tasting stem. The ideal way to cook this stem is to stir-fry it with medium or large sized prawns which have been deveined and cut “butterfly style”. If you are rich enough, you can consider adding scallops! As I don’t have any prawns at home when I decided to cook this dish and I am not rich enough to consider scallops, I used pork and mushrooms as the supporting cast. Marinade pork tenderloin for 30 minutes. Heat oil in wok and fry garlic till beginning to brown. Remove garlic from oil. 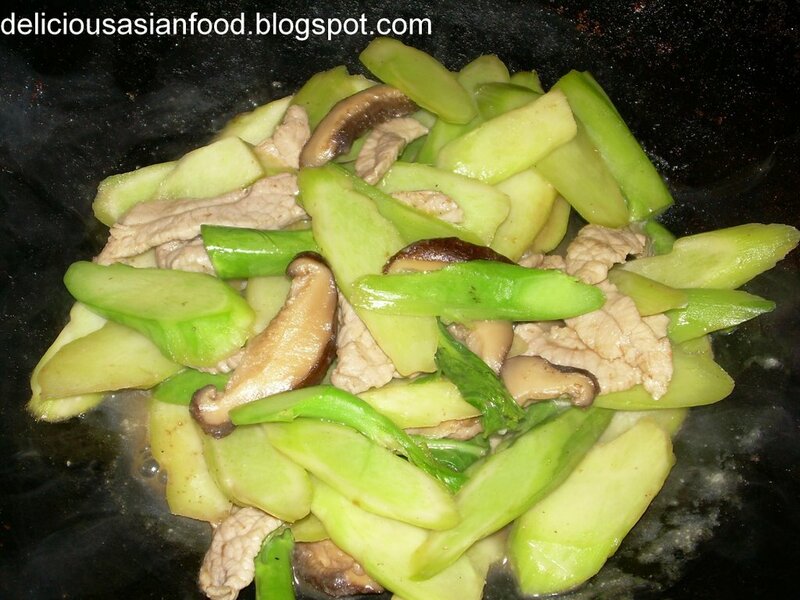 Add pork tenderloin and chinese mushrooms into remaining oil in wok and stir fry for 1 minute. Add kai-lan stems and pre-fried garlic and stir-fry briskly for 1 minute. Add one or two teaspoons of warm water to prevent burning. Add seasoning (except chinese cooking wine) followed by remainder of water and cover lid. Allow to cook for 1 to 2 minutes whilst checking occasionally for drying out of gravy. Once the stems have more or less turned to a darker colour, add chinese cooking wine and stir well. If the sauce is too thin to your liking, add a little bit of corn starch to thicken it.